In the color selector window you have a large variety of options for color selection. 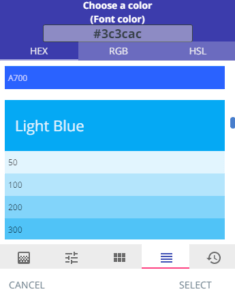 You can either type the code of the color you want in HEX, RGB, or HSL, or you can use the color selectors. The first color selector tool allows you to select your standard color and variations by moving the color tool around. 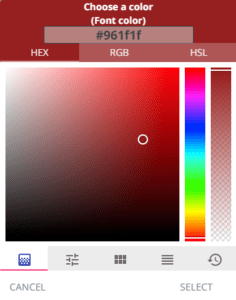 With the next color selector tool you can modify your colors by changing the RGB values. 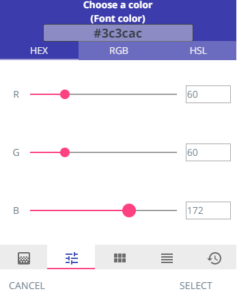 With the third color selector tool you can select from the basic colors. 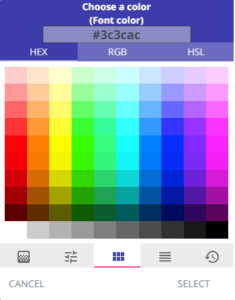 With the last color picker tool you can select the different shades of the colors.